I thought I’d take a step away from our regular weekly round up series to take a final look at the 7 Habits of Highly Effective People* posts I’ve been running throughout February. I first looked at the 7 Habits back in 2008, at this point I was just really starting my self-improvement journey and thought that the 7 Habits of Highly Effective People would be a good place to start. It was interesting to take a look back at the 7 Habits, especially as they’re still some of the most popular articles on this blog. The 7 Habits of Highly Effective People Redux: Habit 1 – Be Proactive What is being proactive, why is it important and how will it help us interact with others? What did I learn from revisiting the 7 habits? I learnt that I was still practicing being proactive quite well, and more often than not I was trying to practice empathic listening. I certainly try to achieve a win/win outcome if it’s at all possible. I think the issues that I’m having with the 7 Habits revolve around habits 2 and 3. I don’t necessarily know what I want and therefore don’t really “put first things first”. I think maybe this is because I haven’t develed as deep into myself as Covey wants us to go (Hey, I’m English so I’m allowed to be repressed, okay?!) so I think that this is something I really need to work on and re-reading The 7 Habits has helped me to realise this. Overall I still think the book is relevant even though it’s over 20 years old. Unlike some personal management books, the 7 Habits* still stands the test of time and can help parents, spouses, children, employees and managers (amongst others) with their relationships with others and themselves. 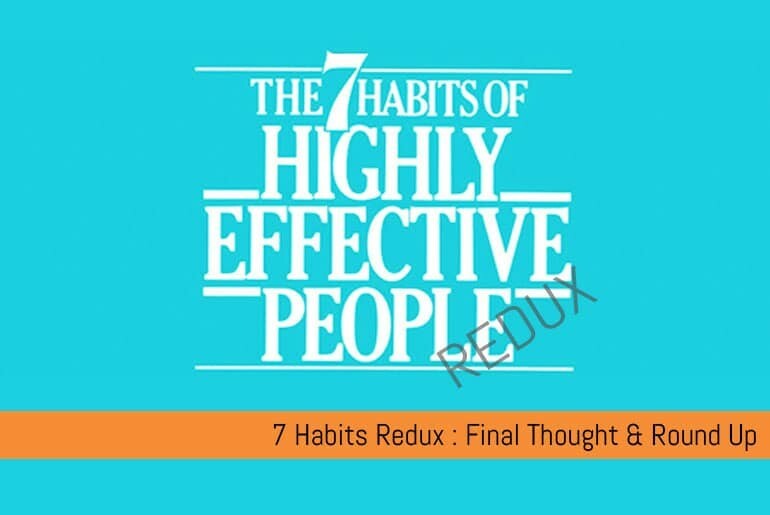 If you would like to read my 2008 series on the 7 Habits of Highly Effective People* you can do so here. If you’d like to read the 7 Habit Of Highly Effective People you can buy it from Amazon here*.